I am searching for Julie's fifth den site and discover it in some thick reeds below a huge outcrop of rocks. Julie is away hunting and 5 pairs of misty blue eyes peer out at me from the dark recess of the den. The white cub is conspicuous in the dark. 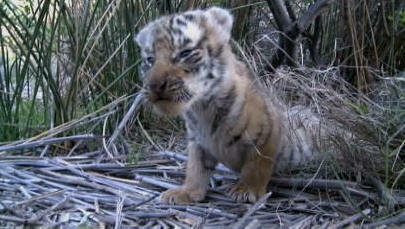 Several of the cub open their tiny jaws in a threat display and one spits at the camera, otherwise they remain silent. I give a soft chuffing sound which calms the cubs and after a while two fall asleep. One cubs responds to my chuff and waddles towards the camera. After half an hour in the den, I leave and on the way out, I encounter Julie returning from her hunt. Julie gives me a beautiful greeting and I decide to follow her back to the den. As she arrives at the den, she gives a series of staccato chuffs to which the cubs respond immediately. All five cubs come tumbling out of the den. The cubs are making soft chuffs and chirps. They are overjoyed to see Julie. Their fear of me disappears, as several try to suckle from me. 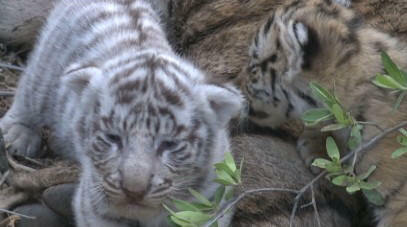 At one point one cub gazes up into my eyes, bobbing its head as it tries to focus. I chuff the cub and it gives a perfect chuff back. 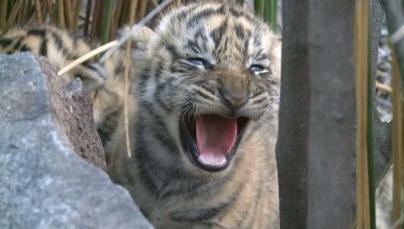 I have just had my first conversation with a 3 weeks old tiger cub and it with me. It is a magical moment. Julie massages every cub in turn with her rough tongue. She takes great care to lick them thoroughly. It is believed that apart from cleaning them, the massage helps their digestive system and blood circulation. Julie lies down outside the den on a large flat rock. 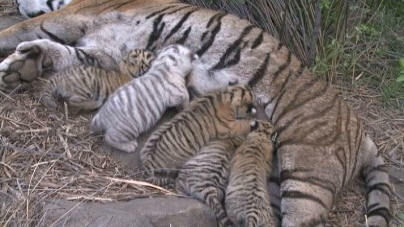 Each cub knows instinctively it is feeding time and there are only four teats amongst five of them. Competition is intense. It is now when stronger cubs will dominate the weaker cubs and runts in the litter will perish. As I watch the jostling cubs, all seem about the same size and strength. There is no obvious weak one. Two cubs are competing for one teat and the one cub pushes the other cub away from the teat. It rolls down Julies body and the momentum takes it off the rock and it falls into the stream below. Fortunately the water is shallow but the cub immediately gives a loud distress call. Now an incredible thing happens. Julie turns her head and gives me a series of chuffs. They are unlike the chuff she uses as a greeting. They are more requesting, even commanding. It is clear she wants me to rescue the cub from the water. My policy up to now has been to observe, record on film but not to touch. However Julie's request is clear, she is unwilling to dislodge the suckling cubs, I must "rescue the cub in distress". I move down into the stream and pick up the drenched cub and return it to Julie. She thanks me profusely with a series of chuffs. 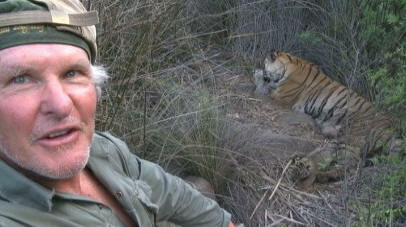 Tigress and human being are not only communicating, they are understanding each other, helping and working together. For one brief moment at Tiger Canyons, I was able to talk to a tiny cub and then on request from its mother, rescue another from the water. A week after this incredible experience, another miracle unfolds before my eyes. I go out early and find July half a kilometer away from her den. She is strenuously marking territory. At Julie's den site, Savannah, the lioness begins a communication roar. Julie responds immediately and heads off towards the den. As I am unable to go on foot with Savannah, I move down to the den in a vehicle. 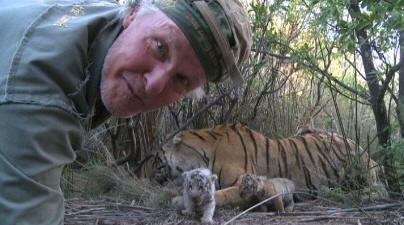 I arrive at the den site to find Savannah and one tiger cub in a small clearing about 200m from the den. It appears that Savannah has arrived at the den while Julie was away and the cub has mistaken her for Julie. It has followed Savannah hoping to suckle. Realizing that the cub is now in the open and vulnerable, Savannah has communicated her concerns to Julie. Apparently Julie can understand the lion roar, for she responds immediately. After a terrific greeting from Savannah, Julie picks up the wayward cub in her mouth and returns it to the den. As she moves towards the den, a second cub gives a distress call. This cub apparently also followed Savannah and is in some dense reeds 100m from the den. 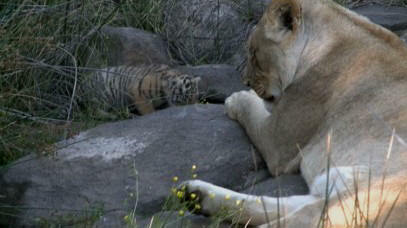 Using a "staccato like chuff", Julie communicates to Savannah to fetch the second cub. It is the same chuff used when asking me to rescue the cub in the water. Savannah apparently understands perfectly well, for she rather clumsily picks up the cub in her mouth and returns it to the den. Lions have an auntie system when raising cubs. Often they will come into estrus together, mate and produce cubs at the same time. 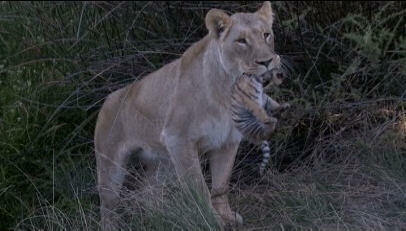 Now one lioness can remain with cubs while the other hunts for food. 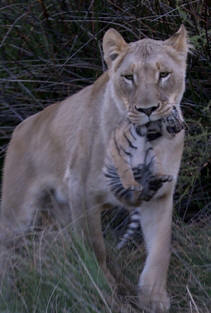 Tigresses raise cubs on their own. They have no help from male or other female tigers. 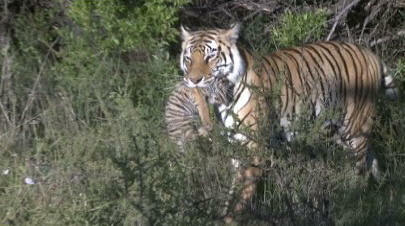 Julie, adaptable as she is, seems quite happy to use me and Savannah to help her raise the cubs. Three years ago I captured a shot on film of Tigress Julie moving Savannah in her mouth to a new den. Now, 3 years later, Savannah is repaying the compliment by carrying Julie's cub back to the den. Two of the biggest cats in the world and a human being, caring, communicating and co-operating to raise a litter of 5 cubs!